In case you haven&apos;t heard already... 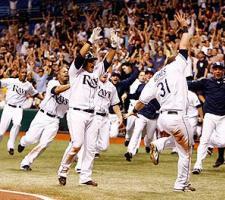 THE RAYS ARE GOING TO THE WORLD SERIES!!!!! Sorry for the caps, I&apos;m just so totally surprised and excited for our very own Rays baseball team! They beat the Boston Red Sox on Sunday, October 19, in the final playoff game at the Tropicana Field in St. Petersburg. I&apos;m not the biggest baseball fan by any means, but I cannot ignore the fact that this was totally unexpected. The Rays will play their first World Series games against the Phillies tonight at the Trop, and will need to win four out of the seven games in order to win the World Series. Once again, Tampa Bay has been put on the map for major sporting events. Tampa will play host to four out of the seven World Series games (if all seven are played) and will also host Super Bowl XLIII at Raymond James Stadium on Feb. 1, 2009. It&apos;s a big year in sports for Tampa Bay. And it just shows that our city is ready and willing to host any event, from the smallest board meeting to the largest sporting events of the year.